So I started researching online on a way to easily sync my pictures to different destinations, thats when I found PhotoSync App. The app is developed by a German company called Touchbyte GmbH in Hamburg, and it seems they got it really right. For USD 3 you can install the application from your AppStore (available for iOS and Android). With this app you can sync to a ton of destinations (no joke), they offer: To and from computer, NAS, between devices, to a ton of cloud services including: Dropbox, Google+/Picasa, Google Drive, Amazon Cloud Drive, Facebook, Flickr, SmugMug, OneDrive, Box, Zenfolio, 500px and SugarSync. 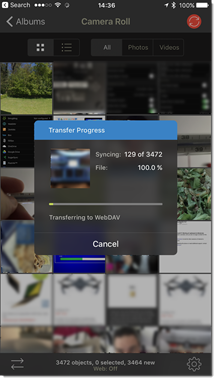 You can configure to have all your pictures transferring in the background, or you can manually trigger the transfer, you can even configure to trigger the auto sync or transfer when you arrive to a specific location, for example home. The granularity of options this tool offers is really fantastic. 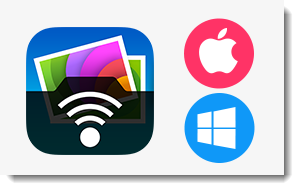 If you want to sync for example to a Windows or Mac you have a companion app that you can download from their website for free, install it on your computer and sync to those machines as destinations for your sync. My wife was even able to use this app for free because both of our accounts belong to the same family :). It would be great to be able to trigger different profiles in order, for example, one that syncs to my SmugMug or Google Photos accounts which have unlimited storage and then only when this profile successfully completes I could have it sync against my NAS, on this last profile I would enable the “Delete pics after import” so I would know all pics are backed up in two locations and also I would be freeing storage on my mobile. While I was running the import of the above print screen (3472 images) the app crashed on the photo 23xx. Not sure what happened but sent the automatic report to the team through the app, I hope they can fix whatever happened. I also sent an email asking for support and received replies in a great timing. I was even invited to check the beta versions of the iOS app to check if this would solve the issue I was having. With my feedback, Helmut said they would be adding some log files to better understand if a transfer fails, why and on which file it did. I couldn’t find a way to disable completely syncing over cellular network, so if I configure a profile to run automatically I make sure I dont even sync anything while on cellular and save data from my data plan. But maybe I am missing something here. What about you? Did you try PhotoSync? If you didnt, how do you sync your pics from your mobile?